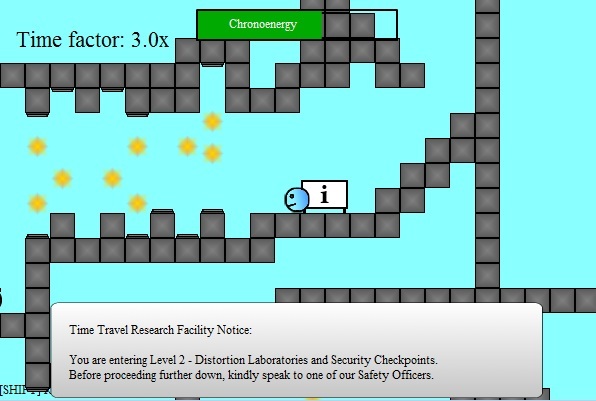 Time Travel Research Facility was the first game I programmed in Flash. It’s a platformer with the twist that the player can rewind or slow down time in order to pass puzzles and battle enemies. The story involves escaping from a secret government facility and the obstacles to overcome are extradimensional monsters and automated defense systems. 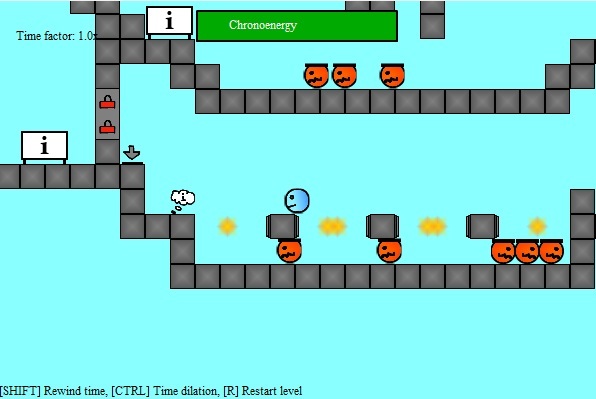 The game was programmed in Flash/ActionScript 3. I also made a reboot of this game called Time Travel Research Facility 2 – I recommend you play that once instead. I created the game at the age of 19, in 2012. Daniel jumps over blocks to avoid extradimensional creatures and sentinels. Daniel just passed a difficult area full of sentinels. I recommend you play Time Travel Research Facility 2 instead. Scientists played with dimension walking down on Level 4 in the Time Travel Research Facility. But the containment was broken and extradimensional creatures now roam the base. You must escape before the thermal sterilization occurs. The reboot has a better story. To stop the music and the game, refresh this page by pressing F5 or Ctrl+R.